Softcover: 211 pages. 418 colour illustrations, 40-50 small b/w text figures. Let us know if you are in interested in this title and we will contact you when we find another. 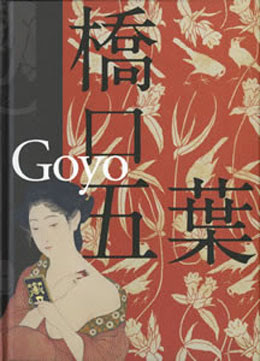 Shows many previously unpublished works by Hashiguchi Goyo. Including the recently rediscovered masterpiece "Haguromo". A "must buy" for the collector of art work from this period. 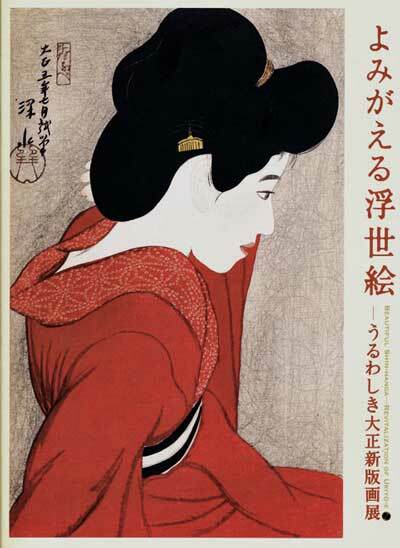 Gives a good visual insight into many different areas of art and design in the first decades of 20th century Japan. Hashiguchi Goyo(橋口 五葉, December 21, 1880 - February 24, 1921) collaborated very closely with Sugiura Hisui(杉浦 非水 May 15, 1876 - August 18, 1965) when they both were working as designer for Mitsukoshi Department Store (Gofukuten). 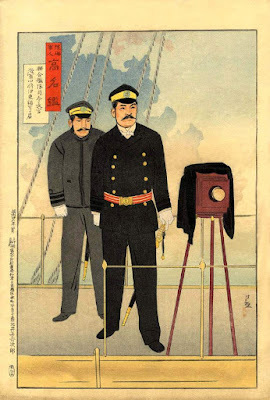 Sugiura was arguably the foremost graphical designer of the very late Meiji period and the Taisho period. 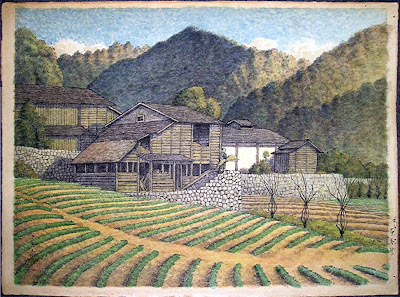 During Goyo's and Sugiura's joint tenure at Mitsukoshi, Sugiura was Mitsukoshi's head-designer, Goyo's work is profuse but more sporadic then Sugiura's . Goyo's and Hisui's styles blended so closely that on most unsigned works it is almost impossible to say which one did the design. Goyo's cooperation with the author Natsume Soseki(夏目 漱石, February 9, 1867 – December 9, 1916) is carefully examined. The present catalog gives ample opportunities to make an appraisal of Goyo's entire body of work. 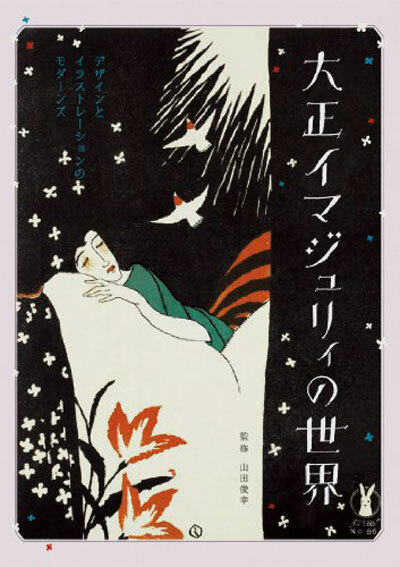 The value of the catalog is in the huge amount of illustrations of never before published works and in this respect it's a big improvement on Iwakiri's previous Goyo Exhibition catalogue (1995). A must have for the Shin hanga collector. More reference books on Japanese woodblock prints, to improve your library and your knowledge. Values of Japanese Prints in an Appraisal - Different values for the same print?! Kawase Hasui (1883-1957) - Zojoji Temple in Shiba (Shiba Zojoji), from the series "Twenty Views of Tokyo (Tokyo nijukkei)", 1925. 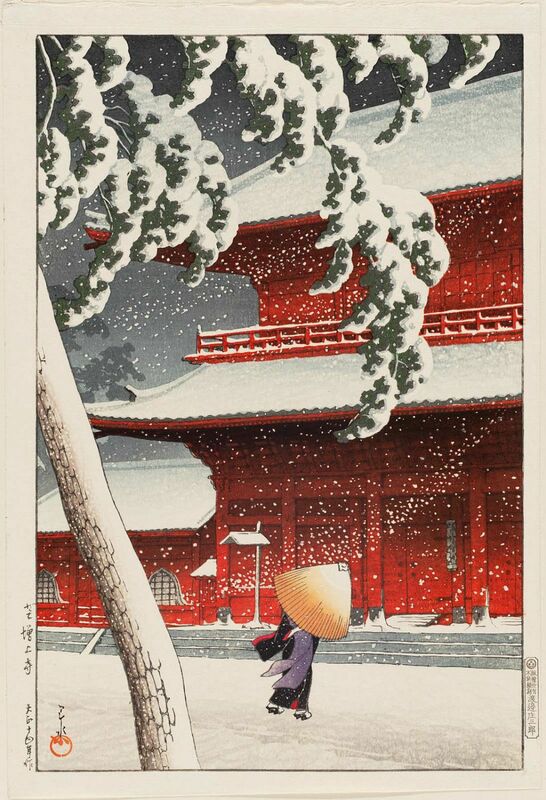 Zojoji in Snow is the best and most popular of the woodblock prints by Hasui. The "fair market value" is typically between $1'000-20'000, depending on condition and edition. Warning: There are recent impressions from recut blocks with a much lower value. For correct evaluation and appraisal of Hasui's prints please contact us. Different values for the same item!? How do you know which one is the right one for your purpose? What do the different appraisal values mean? I would like to show you the 5 most common value types in appraising Japanese prints, paintings and illustrated books. Retail Replacement Value (RRV) (or Insurance Replacement Value). If you want to buy a replacement for a lost item or a collection in a short time, you will go to a high-end Japanese print dealer. The price you pay is the Retail Value, this should get you a high-quality item with full guarantees of authenticity and condition. Replacement Value is normally used for insurance evaluations. High-value prints or collection; it is very difficult to assess the RRV in a high-value Japanese print appraisal, it usually needs the appraiser to work with a very experienced International Japanese print dealer, or having the collection appraised by a highly experienced specialist dealer/appraiser. Usually, RRV and FMV are very close or identical for comparable high-quality items. Fair Market Value (FMV) is what a buyer would be willing to pay in a public and carefully catalogued Japanese print auction or in the open market, where both the parties have the full information about the market and the item traded. Fair Market Value is usually used in income and estate tax valuations. The FMV is described and defined in length for example by the US - IRS in various rules and regulations, as also other National Tax Services in various jurisdictions does. We have fairly comprehensive knowledge about rules relating to taxable values in several of the main jurisdictions in the world as well as common inheritance issues. In reading auction results many of the items are not in good condition, late printings or sometimes even fakes. This can't be discerned by the generalist appraiser who relies upon auction result lists. The specialist has his vast (hopefully) detailed experience and annotated auction catalogues, and therefore can make a much better call. Marketable Cash Value (MCV) The Marketable Cash Value is the money you would receive after deducting the sales cost from the Fair Market Value (FMV) selling your woodblock prints in a well-published and well-attended auction. Typically the sales cost are as follows Hammer Commission (buyer's commission) (20-30%), Sellers Commission (15-30%) and various costs (insurance, illustration, printing, cataloguing, storage, transport, packing and similar). Typically the auction house keeps about 35-45% of the total selling price, but sometimes the total cost for the seller can come to well over 50% of the FMV. – The seller (you) only receive 40-60% of the buyer's purchase price in an auction! Liquidation Value is the value (price) of an item sold on short notice and with limited market reach. This type of sale is usually conducted on behalf of credit institutions, banks or owners who need to raise cash fairly quickly. The liquidation value (price) is usually lower than the above values. Salvage Value is the expected price realized in a situation where both the seller and buyer have very limited market access and knowledge. Typically the item has been abandoned by the legal owner (for example an abandoned storage unit) or been lost and found without recovery by the rightful owner. This value I have just been asked to opinionate on once, I was the expert witness for the prosecution in a trial of a person accused of buying and trafficking in stolen property. 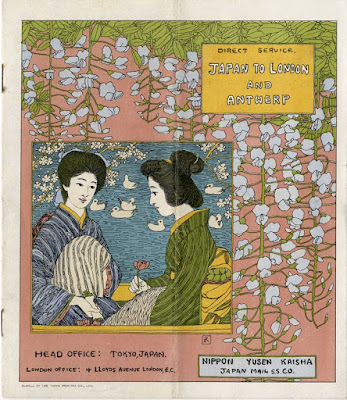 The "Free Japanese Print Appraisal" establish an approximate Marketable Cash Value (MCV) for woodblock prints based on your images or photos, please see "Japanese Print Appraisal" for further details and the email form for the "Free Appraisal". Please remember, the value based on an emailed image is none committing if we see the real print we can give you a correct value. Our "Advanced Appraisals" will give you the Retail Replacement Value (RRV) in the main report as well as Marketable Cash Value (MCV) and Fair Market Value (FMV) on a memo attached to the main report if so desired by the client. The appraisal cover sheet will have a detailed explanation about the general value of your collection, the PM will give a detailed analysis and explanation about the Marketable Cash Value (MCV) and Fair Market Value (FMV) as relevant to your collection and the items therein. Anders Rikardson is a Certified Appraiser of Japanese Prints, Japanese Works of Art and Japanese Art. He has been appraising Japanese prints - Chinese, Korean and Japanese paintings - Chinese, Korean and Japanese art and works of art on five continents. Rikardson started appraising Asian art in 1976 as a junior appraiser and became a Certified Appraiser of Oriental Art (including Japanese Prints) in 1982. He has written many articles about Chinese, Korean and Japanese art in Europe as well as Japan. In the late 1980s, Rikardson stopped his association with the SCC and started as an International Appraiser for institutions, private collectors and major international insurance companies. 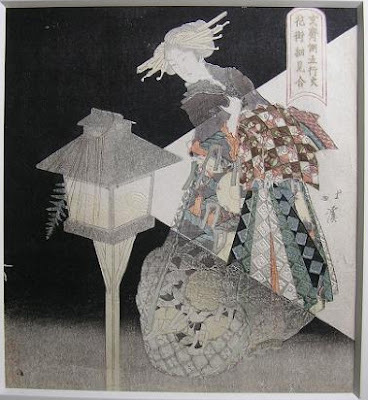 An Oiran in front of a street light on the main street of Yoshiwara. Oiran was the highest rank of the prostitutes working in the "Willow World" of Yoshiwara. A Yoshiwara oiran usually carried the obi tied on the front of the kimono. Condition: Fine condition, fine colours, minute wormhole repaired on the left margin, otherwise fine. Impression: Very fine impression, a deep black, velvet like gradation of the shadows, silver printing. If interested in this or similar prints let us know. We have a large inventory of surimono by Hokusai and his pupils (Hokkei, Gakutei, Shinsai, Katsushika Hokusai II et alia), also many surimono available by other ukiyo-e artists(Kiyonaga, Utamaro, Shunsho, Toyokuni I and pupils, and many others), as well as surimono by artists of the Shijo-Maruyama school. The above image of the surimono is pre-restoration of the minute wormhole on the left. The wormhole is now restored, done by one of the most skillful paper conservators in Japan (and the world). The restoration is "invisible" and the wormhole can not be detected anymore. The print appears trimmed in the above image, however this is due to the mount covering the edges of the print. A new image of this print will be posted later. As a surimono artist Hokkei is Hokusai's most important pupil. 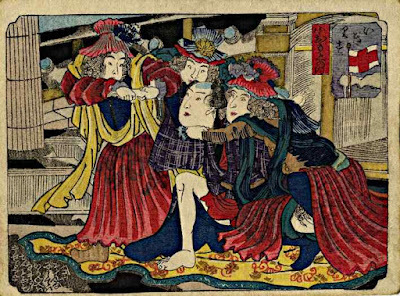 Katsukawa Shunsho — A hosoban print of the actor Arashi Sangoro. Published 1777. The actor Arashi Sangoro II preformed in Edo for six seasons before September 1777, when he left for acting in Osaka and Kyoto. He seems not to have returned to the kabuki theatres in Edo. Katsukawa Shunsho was the first artist to introduce the "realistic" actor portrait. Condition: Fine, very good colours, beautiful deep oxidisation of the bridge rails, small repair top margin. Date: Ca. 1770-1776, stylistically and also the writing of the signature points towards a date of the first two or three years of the 1770s. Late Meiwa or very early Annei period. Very rare (not in Ueda/Clark - Shunsho, Chicago Art Institute). Provenance: Deaccessioned from the Metropolitan Museum, New York. Metropolitan Museum seal bottom right. The validity of the deaccession has been confirmed in an email exchange between us and Masako Watanabe, Ph.D., Senior Research Associate, Department of Asian Art, The Metropolitan Museum of Art. A surimono showing a bunjin's collection of antique ink sticks. The ink-stick is one of the four prized possessions of the classical scholar. the others are the brush, the inkstone and paper. All four became art objects in their own right not only utilitarian implements. The inkstick was not only a decorative object but also the colour and sheen of the ink was considered a major quality sign. A very dark grey with a sheen of old heavily tarnished silver was most sought after. The most refined inkstick of the late Ming-period have a scent of musty withering pineneedles. Size: Oversized long surimono, nagaban size. Condition: Fine, original fold marks as published. Impression: Very fine with elaborate metal pigment and lacquer printing. If you are interested in Zeshin, contact us, we have a large selection of works by Shibata Zeshin (是真紫田). 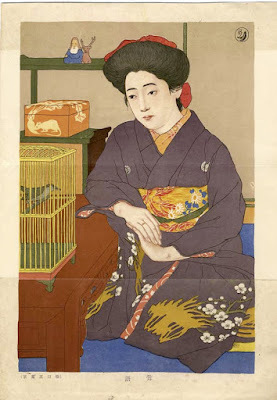 A surimono showing a kacho-ga (birds and flower) subject. In Japanese art the rooster is often a symbol of the "Five Virtues" - Courage, Martial Spirit, Loyalty, Virtue and Literary Accomplishment. In the above image he also embodies "Good Husband, protector of the family". Condition: Fine, original fold marks, as published. We have a large selection of Shibata Zeshin’s (是真紫田) works for sale; drawings, prints, surimono and paintings. The Zen Buddhist patriarch Daruma (Bodhidharma) is seen from behind holding a fly-whisk. 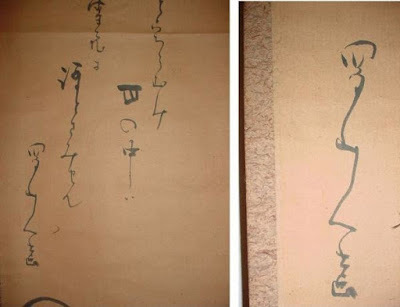 Both the painting and the poem is by Ota Nampo (Ota Nanpo). 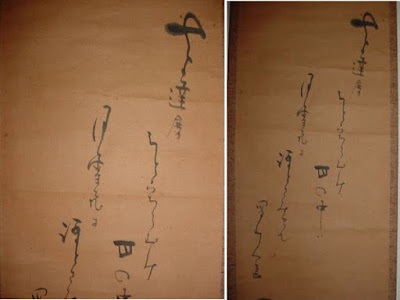 The poem above is signed Shokusanjin. Date: First years of the 19th century. Condition: Generally good, but some toning to the paper, it is less toned then you would imagine from the images. Some crease marks, some light soiling scuffs and stains. Size: A hanging scroll, kakemono, Painted on paper. The mount seems to be a period mount. Later top and bottom, jikusaki (scroll knobs) later. Ota Nampo (Nanpo) (a.k.a. Shokusanjin) was the most influential bunjin, calligrapher, poet and writer of the late 18th cent and early 19th cent. Shokusanjin worked together with for example Hokusai, Eishi, Utamaro, Toyokuni I, and numerous other ukiyo-e artists, as well as artists from other schools. 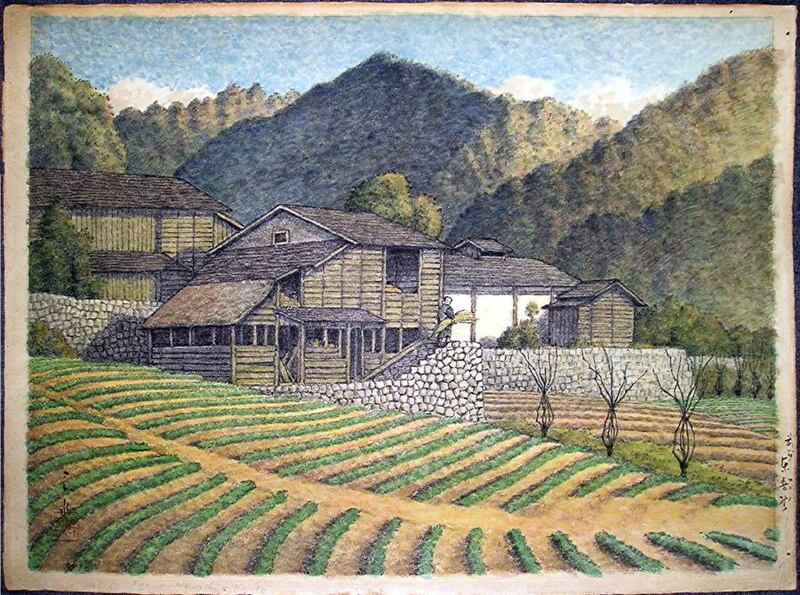 It is very difficult to find an original painting by Ota Nampo, less then 10 are recorded. The poem has no yet been read and translated. 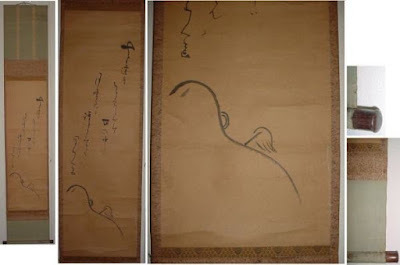 We have the most comprehensive collection of original calligraphies by Ota Nampo (Nanpo), for sale, available. We further have a large selection of original works by other poets and authors of the Edo period as well as illustrated books, paintings, calligraphies and prints. Japanese woodblock prints - How to make a woodblock print, Japanese style. A 5.5-minute video on Japanese style woodblock print making by the 73 years old Canadian artist Graham Scholes. Graham walks you through the entire process from making the necessary keyblock drawings, preparing the woodblocks for cutting. Then he cuts the key woodblock and the colour woodblocks. Grahams shows you how to apply the colours to the colour woodblocks and print them. Voila a "Japanese woodblock print" made in Canada. Included is also a very short scene on traditional Japanese paper making in Japan. There are some subtle differences between Graham's technique and the traditional ukiyoe style printmaking. Hopefully we can post a video of a traditional Japanese print maker some time in the future and explain the differences. Thank you very much Graham for producing a very good visual of woodblock print production. Thanks!